By John ~ December 14th, 2009. The wine trails guy, Steve Roberts, has done it again, completing his trifecta of Northwest wine guides with this book, WineTrails of Idaho. Earlier this year when I was visiting with Steve about his WineTrails of Oregon book, I asked him what was next and he mentioned this book, so I wasnâ€™t surprised when I recently received a review copy. I thought Steveâ€™s first book, WineTrails of Washington, was a very good book and it has been extremely helpful to us in our wine country travels in the state of Washington. Then I was amazed that he found over 200 wineries that he organized into 24 wine trails in his second book, WineTrails of Oregon. But when he told me about this book on Idaho wineries, I thought to myself, â€œThis ought to be a short one.â€ Iâ€™ve been to Idaho wine country and remembered only about half a dozen wineries, albeit some pretty good wines. To my surprise, Steve found 21 Idaho wineries with regular tasting room hours that he organized into 4 wine trails; and 12 more Idaho wineries open by appointment. 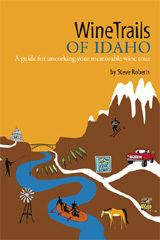 Once again, Steveâ€™s book is attractive, well organized, and easy to follow as you travel in Idaho wine country. He not only tells you about the wineries but gives you excellent suggestions for traveling in wine country, including tasting room etiquette, wine tasting 101, descriptions of the popular Idaho wine varieties, and helpful hints on decoding an Idaho wine label. Before you visit Idaho wine country (or visit it again), be sure to pick up a copy of WineTrails of Idaho. For that matter, pick up a copy of all three of his WineTrails books. They are all excellent. I have to get this book. I was just talking to a rep from Idaho the other day, curious about there scene. Seems to me like central ID has a great wine growing area – hot dry summer days, cool nights, cold winters. Can’t wait to give this book a try! Thanks for the comment. If you don’t have the other two books in this series, you should get them, too. I also recommend these books. WA and OR are on my shelf when not in use, and have been given as presents. ID is next!